Argentina has known famous populist leaders in the past, for instance Juan and Eva Péron and Carlos Menem in the 20th century. Kirchner, who began her 2nd term in October 2011, has adopted the peculiar brand of Argentine populism (also called Peronismo or Justicialismo) which utilizes both far left and far right ideologies that stir up resentment between the economic classes in the country. The tragedy of Argentina is that it was, circa 1900, one of the largest and most prosperous economies in the world. Kirchner's techniques of shifting public attention from real problems in her country to emotional issues that serve as a political distraction sometimes deserves admiration, but anyone can see that these populist measures don't fly in the long run. Kirchner whipped-up nationalism over the British-controlled Falkland Islands (Malvinas) lately. 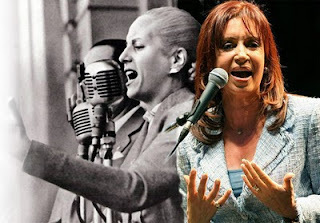 She is also known to make speeches with images of Eva Perón in the background. The image of Evita is selected according to the tone of the speech. She makes frequent appeals to pity by mentions to the death of her husband Néstor, who died in October 2010, and her own pain about it. Kirchner extended the mourning of her husband's death to approx. one year - overlapping the 2011 presidential elections campaign - and by only wearing black attire. Kirchner has drawn criticism for her excessive spending on clothes, jewelry and shoes. For instance the Argentine president purchased ahead of her meeting with President Sarkozy in September 2011, 20 pairs of Christian Louboutin shoes in Paris at approximately $5,500 a pair and in addition to Louis Vuitton bags, Hermès Birkin and Kelly bag purses. Regarding the 51% YPF expropriation of YPF, which will leave Repsol-YPF with 6.4%, the US and EU mainstream media are shouting populism, while the politicians and media of ALBA countries applaud the expropriation. During the president´s announcement of the expropriation (wearing black attire), her ministers accompanied by police barged into the Repsol office and gave executives five minutes to leave the premise. She ended her announcement speech referring to her late husband saying that he supposedly "always dreamed of recovering YPF for the country, always, always." So is this Argentine populism or not? Kirchner doesn't seem to tell the whole story though. Kirchner is holding domestic petrol and gas prices low for quite some time now as a stopgap solution for her economic policy; but low domestic petrol and gas prices are decreasing YPF's profits seriously. Kirchner raised YPF frequently in speeches during March 2012, claiming that underinvestment and excessive dividends at the firm had caused declines in output. Argentina's Oil production has declined with one third since 1998. What Kirchner forgot to tell is the reason that YPF underinvested in Argentina's oil production: the imposed price controls on petrol and gas in Argentina and the taxing on oil exports that made it difficult to make new profitable investments in production. As a result, natural gas is 75-80% cheaper in Argentina than in its neighbours, and electricity is 70% cheaper. Repsol-YPF has invested $11 billion in Argentina since 2006 while handing out $3.5 billion in YPF dividends, nevertheless Repsol-YPF did successful invest in exploration as explained further on in this blogpost. The significant shareholders of Repsol (Caixa-bank 12.38%, Sacyr 10.01% and PEMEX 9.49%) probably decided to invest the money where it's most profitable...and that didn't seem to be oil-production in Argentina. As a result Argentina had to spend $9 billion in energy imports in 2011. The excessive dividends that Kirchner was talking about (90% of YPF's 2011 profit) are indeed excessive, but there is a story on this as well. Read on. The once 98% Repsol ownership of YPF in 1999 decreased to 57.4% in 2012; 25% is now owned by Eskenazi family of Buenos Aires (Grupo Peterson) and 16% remained in private portfolios. Three Eskenazi family members did have positions in the board of YPF until April 16th; Sebastián Eskenazi was CEO, his father Enrique was vice-president but he still is president of Grupo Petersen. Enrique Eskenazi was a good friend of Cristina Kirchner's late husband Néstor. 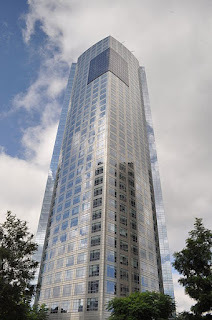 While Cristina Kirchner assumed office on December 10, 2007, Eskenazi and Repsol did agree to purchase 25% of the subsidiary YPF on December 20, 2007. The package was purchased in three tranches to avoid a mandatory bid of 100% of the YPF shares. In 2008, Grupo Petersen financed a 14.9% acquisition of YPF with a $1 billion vendor's loan from Repsol and a senior secured $1 billion loan from a group of banks led by Credit Suisse. Grupo Petersen obtained another 0.1% in YPF stock the following year, and in 2011 it purchased an additional 10% stake, funding the deal with a $700 million senior secured loan from a group of banks led by Brazilian Banco Itaú and Credit Suisse. Repsol pitched in with another vendor's loan of about $625 million. The agreement also commits both shareholders to maintaining YPF's dividend payout at 90% of net income at least through the payoff of the senior loan, and any change in that provision is an event of default under the term loan. Néstor Kirchner was well aware of this agreement between Repsol and Grupo Petersen and he didn't object to the high dividend payout at the time, because it was Néstor Kirchner's idea all along to introduce Eskenazi as a major shareholder to make look YPF more Argentine. For Eskenazi a risky 100% financing seemed to be the only option to acquire the share. Grupo Petersen had to repay the loan and pay the interest and it needed the YPF's dividend badly for that. However, politicians often do change their minds; in 1992 during Carlos Menem's presidency, Néstor Kirchner the then governor of Santa Cruz, was very enthusiastic after the privatization of the state oil company YPF. Not in the least because the province of Santa Cruz received over $500 million for the sale as one of the shareholders. So it looks rather odd that Cristina Kirchner objects the high mandatory dividend payouts after 4 years; after all her late husband was the initiator of the Eskenazi plan and fully agreed with all the conditions, including the high dividends. Repsol-YPF also agreed in 2008 to buy back the Eskenazi family’s YPF-shares in the event that Repsol-YPF loses majority control. Grupo Peterson might try to execute this option now and claim a share price of $23, because the quote of YPF stock plunged from $23 to $14 in the 3 weeks after the announcement of the expropriation. The YPF stock quote was still $40 in February 2012. YPF's future dividends might be too little to repay the $1.9 billion loan to Repsol-YPF. Repayment of the loans may be even impossible for Enrique Eskenazi's Grupo Peterson, unless Cristina Kirchner offers a "helping hand". If Grupo Petersen defaults, the 25.5% stake would be divided between the debt holders, leaving 22 percent of YPF to the lending banks and 3 percent to Repsol. While the Argentina government has no say in YPF's dividend policy, the Argentina government demanded already in March 2012 to suspend payment of dividends and reinvest those funds to stem the decline in production. In a response Repsol-YPF offered to propose to YPF shareholders to capitalize the company with money from last 2 year's profit in new shares. The government's demand was turned down by Repsol-YPF and eventually this led to the decision to expropriate YPF. Besides the production decline, the high YPF dividends and nationalistic arguments, there is an important 4th factor: the find of enormous shale oil and gas reserves in Vaca Muerta by YPF-Repsol in September 2011. Shale oil and gas are unconventional hydrocarbon resources and can only be recovered by "fracking" or induced hydraulic fracturing. Fracking can cause contamination of water aquifers or groundwater. Vaca Muerta is the name of a rock formation of 30,000 square kilometers in the Neuquén Basin, in the Argentine provinces of Neuquén and Mendoza. On November 6, 2011 Repsol-YPF estimates that the 428 square kilometer area explored in the Vaca Muerta called Loma La Lata, with 15 installed wells, has oil and recoverable gas resources equivalent to 927 million barrels of oil. These findings doubled Argentina's reserves, reaching a total of 4,000 million barrels of oil equivalent. YPF has rights to 12,000 kilometers of the 30,000 square kilometers of Vaca Muerta and only 428 square kilometers were explored yet in November 2011. But rigs and other specialist equipment are in short supply in Neuquén due to import regulations and severe lack of infrastructure. Vaca Muerta has attracted ExxonMobil, EOG Resources and Total, however it is YPF that has advanced the furthest in exploration. The USGS even said that the country could contain the world’s third-largest shale resources, behind the US and China. In the same Neuquén Basin there is another rock formation that contains large shale gas reserves called Los Molles that is below Vaca Muerta and much thicker. In Februari 2012, Repsol YPF had upped its estimate for the shale oil it found in Argentina to nearly 23 billion barrels, enough to double the country's output in a decade. But the Spanish company said it would cost $25 billion a year to develop, and warned that Argentina would need to overhaul its energy policy to attract the necessary investment. These large reserves of shale oil and gas in Neuquén, the large concessions of Repsol-YPF in Vaca Muerta and the large investments that are needed to develop these shale reserves might have puzzled the Argentina government how to achieve a rapid development. They might have drawn the conclusion that Repsol-YPF is too small for the job. It's no coincident that Repsol-YPF announced its latest estimate for shale oil in February this year, while the government began to renegotiate Repsol-YPF's investments in March already and YPF was expropriated in April. Cheap energy helped Argentines rebuild after a world-record debt default and devaluation in 2002 left Argentina's economy in ruins. Argentina defied the International Monetary Fund (IMF), firstly by ignoring advice on implementing austerity measures, then by clearing its debt. The break with the IMF meant that Argentina fell off the radar of most foreign lenders and investors. Argentina's economy has grown at a high rate since 2003, but Kirchner has a growing problem to finance her budget every year. Private pension plans, which required growing subsidies to cover, were nationalized in 2008 to shed a budgetary drain as well as to finance high government spending and debt obligations. Another issue is the high inflation; official figures say inflation is about 10%, but realistic figures say it is over 20%. This year political tension arose about Kirchner’s 2012 budget call for $5.67 billion of the central bank’s foreign-currency reserves to be used toward debt payments. The administration borrowed $15.9 billion the previous two years for the same purpose. During the public announcement of the expropriation of YPF Cristina Kirchner said that YPF should be Argentine again. The same day the streets in Buenos Aires were full of posters saying "Son Nuestras - YPF CFK - Son Argentinas". But it looks like Kirchner has no money at all to pay for the 51% of YPF ($10.5 billion according to Repsol). The stock quote plunged dramatically, so with good lawyers she could have the 51% share for a bargain price and she could even have Eskenazi's 25.5% share for the same price. But no monies to buy the 51% share; even more important she doesn't have the large capital to invest in development and production either. So what she will try to do is sell the 51% or 76.5% for the same bargain price to Petrobras and/or Sinopec and try to make new deals with the new shareholders to invest in the long term development and production of Vaca Muerta (approx. $25 billion/year) and Los Molles. But foreign investors will only bite if Kirchner can give strong guarantees and if she will lift the tax on oil exports or the obligation to sell oil and gas for low prices in Argentina. It's a huge gambit, but it may work out politically and financially. Petrobras and Sinopec already said they wanted to discuss options.